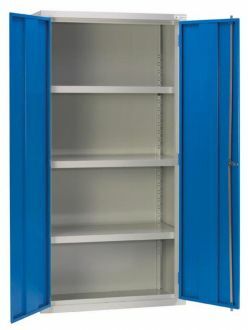 Good quality cupboards, fully manufactured, ready to use. 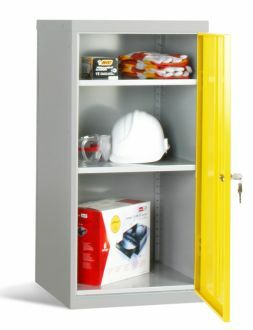 Only the best quality steel cupboards for garage or office storage. Top value cupboards for garage, office or industry. 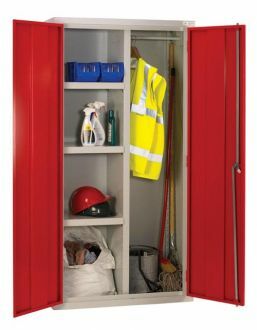 Fully manufactured in steel, delivered ready to use - no assembly required. 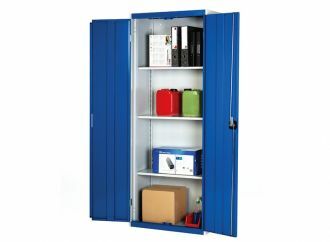 All our steel storage cabinets are fully manufactured and delivered ready for use in your garage, office or business. 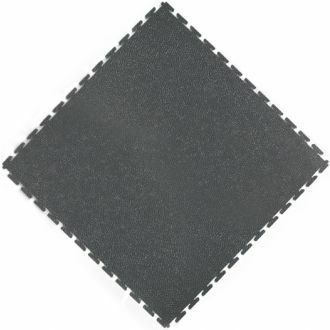 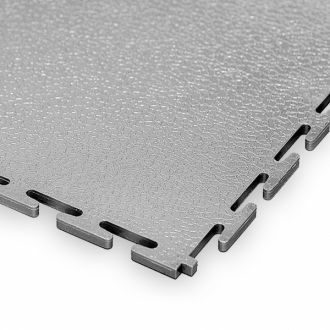 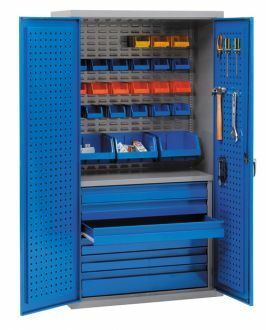 The majority of our metal cabinets are derived from industrial products and as a result are strong and durable to ensure complete customer satisfaction. 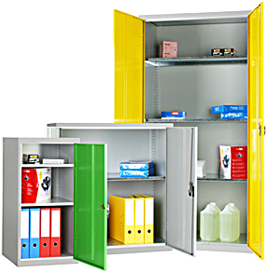 They have high quality anti-bacterial powder coatings, rigid metal reinforced doors, and adjustable height shelves. 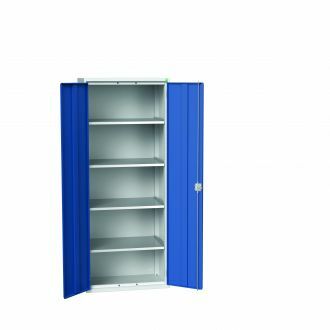 Welded and reinforced construction ensures a solid, safe and secure cupboard capable of carrying high loads. 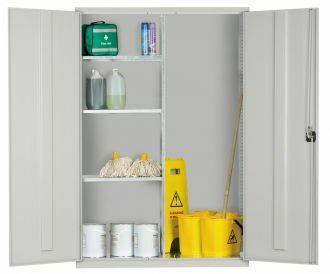 A standard and very economically priced steel cupboard. 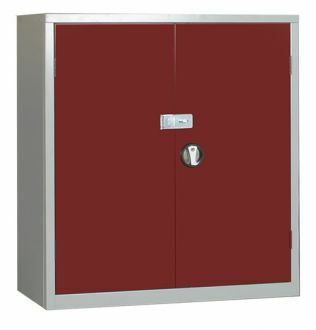 Three galvanised steel shelves, plus floor and a lockable door. 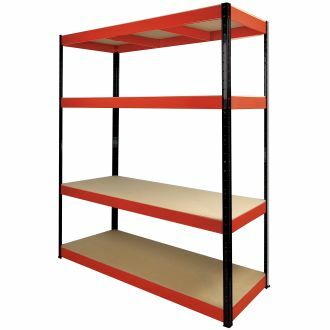 1830mm x 915mm x 457mm steel shelving cabinet. 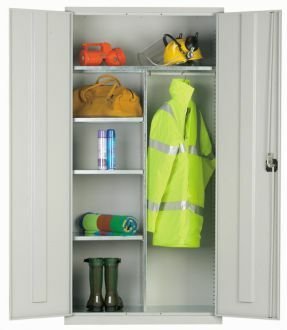 An economically priced steel wardrobe cabinet with a single galvanised steel shelf and hanging rail. 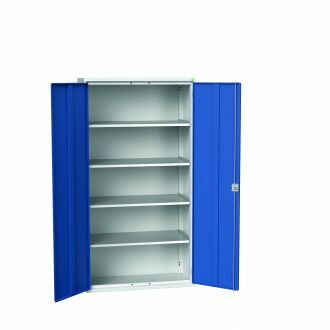 Ideal for storing outdoor clothing, work clothing or motorcycle gear. 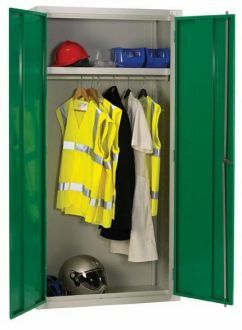 A clothing and equipment cabinet for clothing, outdoor shoes, motorcycle equipment, crash helmets etc. 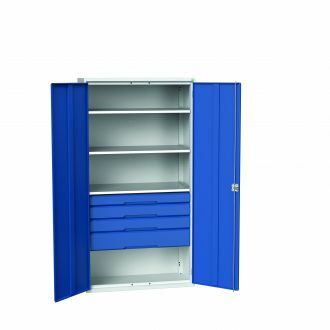 1830mm x 1220mm x 457mm EXTRA WIDE steel clothing and equipment cabinet. 1830mm x 1220mm x 457mm EXTRA WIDE steel wardrobe cabinet two compartment. 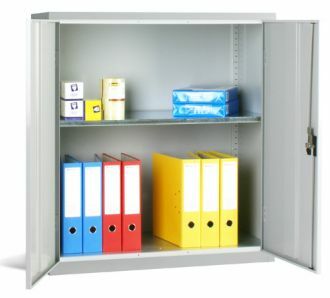 A lower cost, small steel cabinet 1000mm wide suitable for home and office. 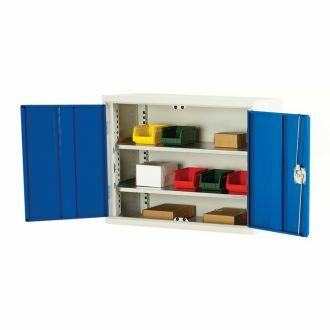 Ideal for securely storing stationery, tools or instrumentation. 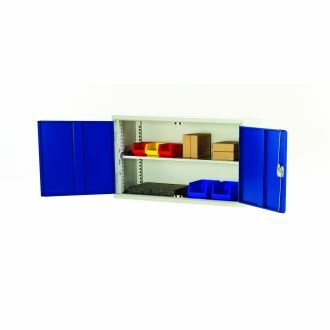 A very useful and versatile range of combined drawer and shelf cabinets 2000mm high and 1050mm wide. 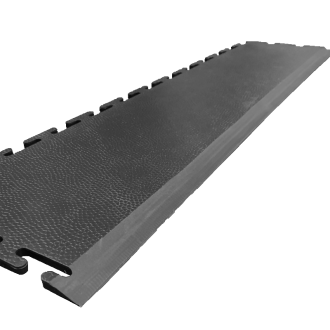 Depth 550mm. 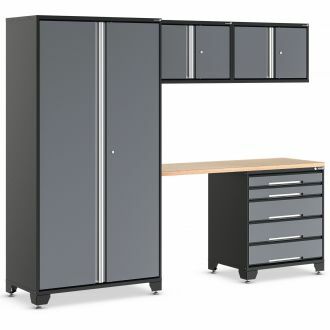 A very useful and versatile range of combined drawer and shelf cabinets 2000mm high and 800mm wide. 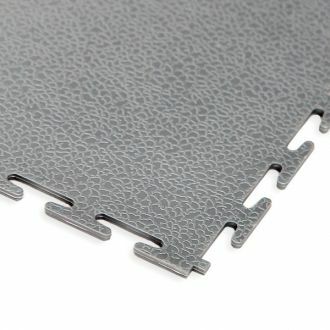 Depth 550mm. 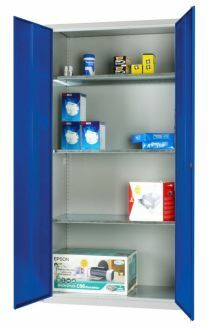 A strong lockable shelving cabinet with having three shelves plus the floor, all capable of carrying heavy loads. 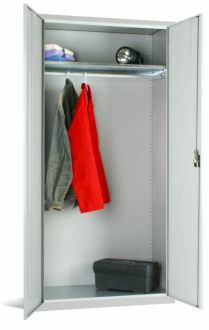 A steel wardrobe cabinet with a strong clothes hanging rail and a convenient top shelf. 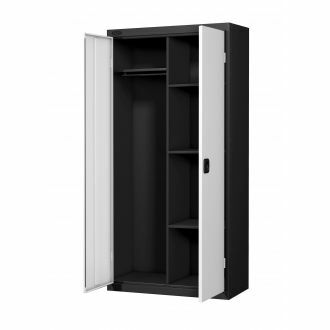 A strong lockable cabinet with a tall section on the right incorporating a clothes rail. 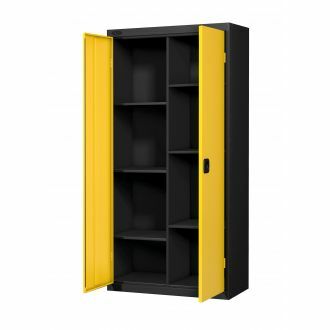 Store all your tools and small items securely in this heavy duty secure cupboard. 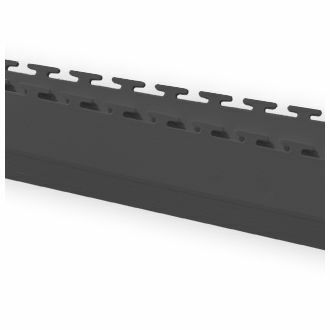 One deep drawer and six shallow. 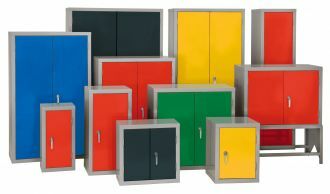 A range of heavy duty steel storage cupboards in various sizes and colours. 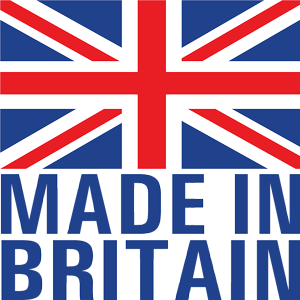 Good quality products manufactured to order. 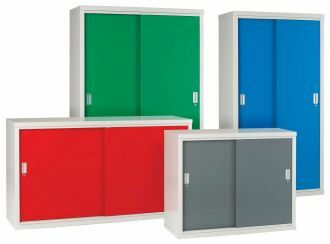 Sliding Door Cabinets - ideal for confined areas. 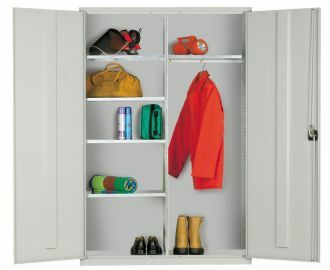 An alternative to hinged doors. 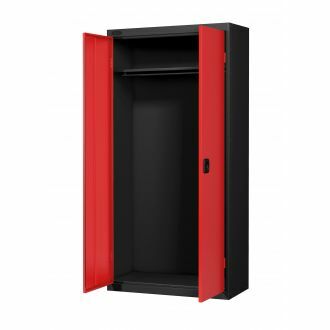 Slide open the doors unhindered by cars or other obstructions nearby. 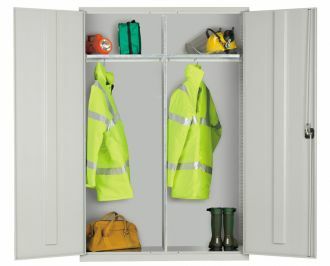 GaragePride's steel cabinets are perfect for storing a multitude of items safely and securely out of site behind attractively coloured doors. 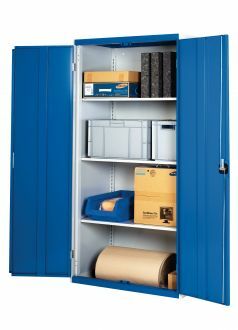 They lend themselves to a huge range of storage needs including office equipment and consumables, industrial instrumentation, office files and of course everything to be found in a typical residential garage that needs tidying away. 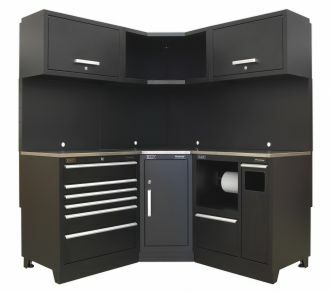 Our steel storage cabinets provide a huge range of secure and spacious storage options for residential garage storage, utility rooms, offices and industry. 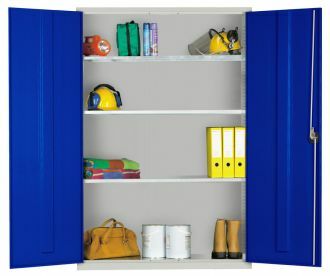 Over 180 colour and size combinations are available ensuring that there is a cabinet available to meet every customer need and taste. 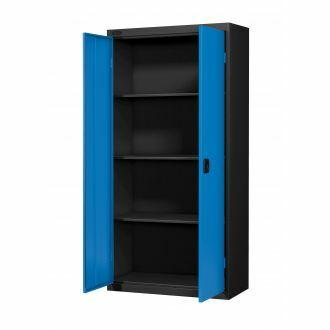 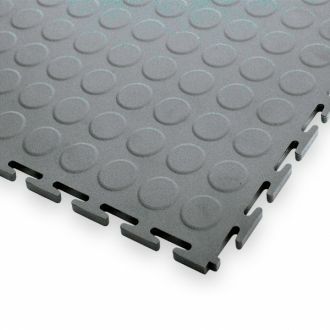 The industrial powder coating is robust and scratch-resistant whilst resisting bacterial growth to help ensure a clean and healthy environment. 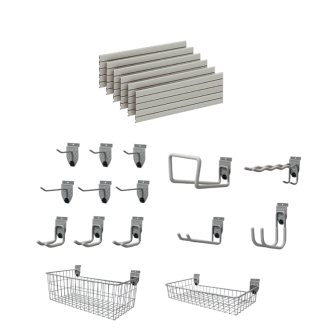 Shelves are can be adjusted to provide various storage heights and can each carry a 70-75Kg load with a large margin of safety. Additional shelves can be specified either at the time of purchase or later on if required. 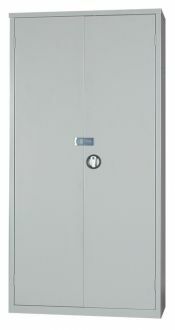 The tough reinforced doors feature high quality handles with integral locks to ensure security where necessary.